* A Special Edition of Real Science Radio: Today we air Part Two of what our staff believes is the most important series of author interviews ever produced in the 24-year history of Bob Enyart Live. Richard Holland is assistant professor of apologetics and theology with Liberty University Baptist Theological Seminary. 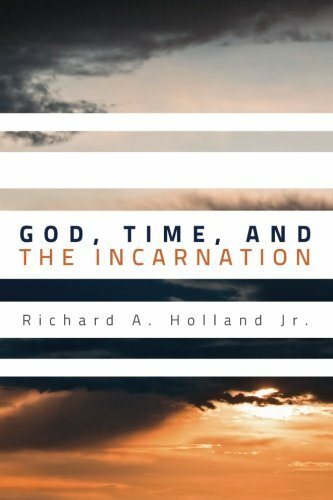 Dr. Holland authored the new book, God, Time, and the Incarnation to explore the impact of God the Son becoming a man on the philosophical doctrines of divine timelessness and utter immutability. You're invited to enjoy Part 1 also. * Isaac Newton, McTaggart, and Cullman: Bob and Dr. Holland discuss Isaac Newton, John McTaggart, and Oscar Culllman. Holland describes Newton's concept of absolute and relative time, as Enyart, with three centuries of hindsight circumspectly suggests what Newton may actually have been referring to. John McTaggart contributed the philosophical terminology of time as the "A Series" (the traditional, tensed view of time) as compared to his own (and incorrect) "B Series" of time as static, not unlike the ordered though atemporal positions of numbers on a number line. Holland then describes Oscar Cullman's analysis of the Greek vocabulary showing that, as we've long reported at rsr.org/time, the New Testament terminology regarding God and time does not support the philosophical claim that He exists outside of time, as Bob adds, but rather, quite the opposite. * Enjoying a Coffee Shop Visit: Rather than conducting a typical author interview and squeezing an overview of a book into a single show segment, instead, Bob and Richard agreed that they will take their time and review the material as though the two men had half a day free to sit next to a fireplace in a coffee shop to consider one of the most far-reaching observations that any human being can make. Consider the insight into ultimate reality provided by the Incarnation of God the Son! We hope you enjoy this 7-interview series as much as we have enjoyed producing it! So, brace yourself. Today's Resource: To order Dr. Holland's book, and receive with it a CD of Bob Enyart's complete interview with Richard, please call 1-800-8Enyart, that's 800-836-9278. The book with the CD is $33 As always, BEL offers a 30-day money-back guarantee, and for repeat customers, if you don't love the book, we'll double that, for a double-your money guarantee! That's how much we love this book and think that you will be blessed if you read it also!